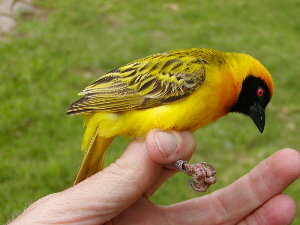 The Southern Masked Weaver was formally described by Louis Jean Pierre Vieillot, a French ornithologist. 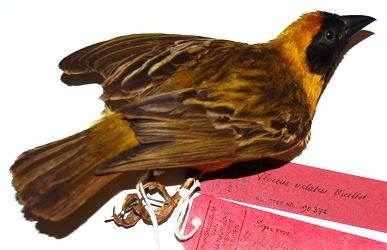 The Southern Masked Weaver was first collected by Francois Le Vaillant, who travelled in South Africa in 1781-84. When Le Vaillant returned to Europe, most of his specimens where sold or given to Coenraad Jacob Temminck, who had sponsored Le Vaillant's travels. 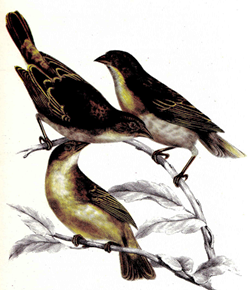 Temminck produced a catalogue of these birds in 1807 and briefly described the Southern Masked Weaver, without providing a scientific name, but calling it "Le troupial a masque-noir" (The oriole with a black mask). He noted that it came from "Namaquois" (Namaqualand). 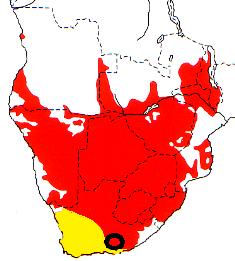 However, several specimens that Le Vaillant listed as from Namaqualand are actually from the Karoo, and Brooke (1985) restricted the type locality of the Southern Masked Weaver to Graaff-Reinet - earlier authors had restricted the type locality to other sites that were found to be incorrect. Le Vaillant reached the Eastern Cape in 1782, and passed through the Karoo in early 1783 on his return to Cape Town. Vieillot based many of his descriptions on the work of Temminck 1807, but included a scientific name. The Southern Masked Weaver was first illustrated in 1828 in Andrew Smith's description of the species. Smith illustrated only non-breeding birds, and the first male in breeding plumage to be painted was by Reichenbach (1863). Ploceus velatus	Vieillot 1819	Nouv. Dict. Hist. Nat., nouv. ed., 34:132	Namaqualand, restricted to Graaff-Reinet, E Cape, by Brooke, 1985, Ostrich 56, 214-215.
velatus Latin: veiled, covered (velare, to cover) [referring to the mask of the breeding male]. 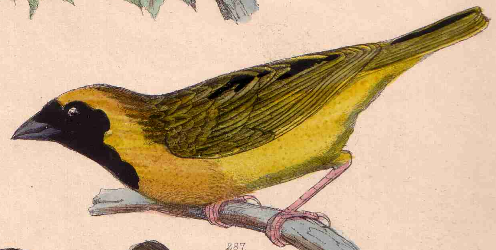 Masked weaver bird (Smith 1828). African Masked Weaver, Black-fronted Weaver, Capricorn Weaver-bird, Greater Masked Weaver, Half-masked Weaver, Lichtenstein's Weaver bird, Mariqua Weaver bird, Masked Weaver, Namaqua Masked Weaver, Shelley's Weaver Bird, Yellow Masked Weaver, Zambesi Masked Weaver. Feb-March 1783, when Le Vaillant was in the Karoo. Two type specimens are in the Leiden Museum (RMNH_90372 and RMNH_90373). Identification. The Southern Masked Weaver male in breeding plumage (photo above left) is bright yellow with a black mask and red eye. In non-breeding plumage it resembles the dull-coloured female, but retains a reddish eye. The female usually has a brown eye but about 29% of breeding females have a reddish eye (photo above right, see pdf paper on weaver eye colours). Distribution. The Southern Masked Weaver has no subspecies listed in the Handbook of the Birds of the World, Vol. 15. Several subspecies have been proposed in the past, but this species is likely to show penotypic variation, ie. the size and plumage variation is due to environmental factors rather than geographic variation in genotypes. It is found in the southern third of Africa as far north as Angola, Zambia, Malawi and Mozambique. It did not occur in the Western Cape historically (see map here). Originally its distribution ranged from the lower Orange River across to Port Elizabeth. 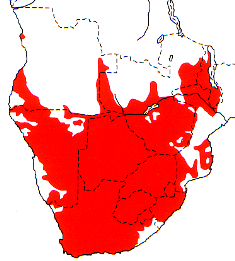 It then expanded its range into the Western Cape and then Northern Cape as shown in the map. It is still sparse in the arid region south of the lower Orange River. Habitat. It is found in a wide variety of habitats, including gardens, but is usually less common in coastal regions. This species is gregarious when not breeding, often roosting and feeding in large numbers. Food. It is mainly a seed-eater, although also feeds on arthropods, nectar, and other items. Breeding. The Southern Masked Weaver is polygnous. The male builds a neat nest which contains a ceiling inside the main structure as rain-protection. If a female accepts a nest, she lines the chamber with grass seed heads or feathers. Nests are built in trees, bushes, reeds, bamboos or man-made structures, like barbed wire fences. The latter is well illustrated by the very first PHOWN record (Photo below, phown 1). One of the most abnormal weaver nests was built by this species - see phown 694. Colonies in drier areas tend to be larger with several males present, while this weaver tends to disperse into single-male colonies in urban areas with around 3-10 nests per male. Eggs vary in colour, bluish or whitish, being plain or marked with fine or larger spots and blotches. This is one of the most common host species to the Diederik Cuckoo. Chicks are fed by the female, and very rarely by the male. When fledged, the juveniles may remain in the same area or disperse several kilometers.